Quite simply the sport or pastime of travelling down a river on a raft. 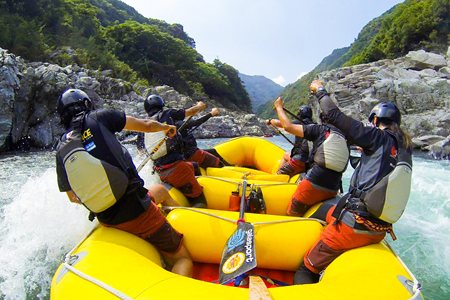 Commercial rafting commenced in the early 1990’s in Japan and has steadily increased in popularity as people grow to understand what a great vehicle a raft is to explore and experience Japan’s amazing rivers. Not only as an extreme sport but as a way for children and families to appreciate the magic of our rivers. The IRF conduct a World Rafting Championship every year. This year 6 person teams will come together in Japan to determine who is the world best. 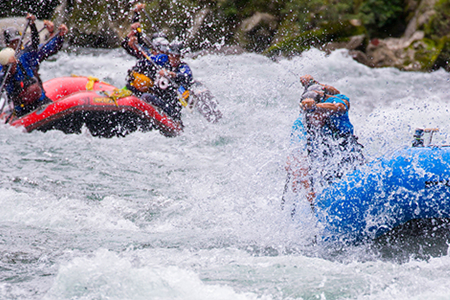 Rafting competitions consist of 4 disciplines. A timed race over a short distance. Teams race in pairs Head to head in a knockout elimination format. 8-14 gates. Competitors must pass through all the gates, some being upstream. The most demanding discipline, most points rewarded. Teams are awarded points in each discipline according to their finishing position. The overall results are determined by ranking teams according to the total points they have achieved over the duration of the competitions. 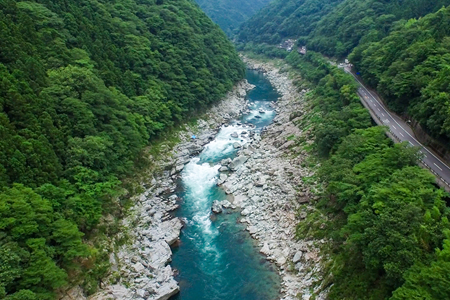 Yoshino River is loved as a sacred rafting place in Japan by many river guides. The river appropriate for the torrent of the world level including the shallow more than 2meters of drops. There is abundant quality of water of only regular grade 4 in the country. Furthermore, the quality of the water to be able to foresee to a surface of a river and the bottom of the emerald green attract many participants from all over the world.